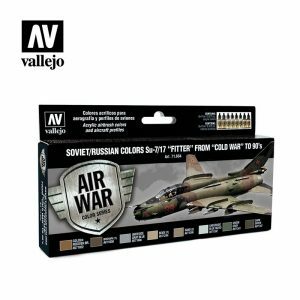 Set with 8 Model Air colors in 17 ml., developed for painting the camouflage patterns of most of the US ARMY AIR CORPS aircraft deployed in the Mediterranean Theater of Operations (MTO) during WWII. N. 41 Olive Drab: Due to the large stock available this color was used before and during the entire war on the upper surfaces of al types of US ARMY aircraft. N. 43 Neutral Gray (FS 36173): Color used before and during the War, owing to the great quantity of stock available, on lower surfaces of all kinds of aicraft in the US ARMY. ANA 609 Azure Blue (FS 35231): Lower color desert pattern of the RAF, adopted by the USAAF, combined with ANA 615/ANA 617 on upper surfaces. ANA 611 Interior Green (FS 34151): Standard color for most cockpits and crew areas throughout the entire war. ANA 615 Middlestone (FS 30266): Upper surface color desert pattern combined with ANA 617 and ANA 609 on the lower part of the fuselage. Similar to RAF color for operations in this theatre of operations. 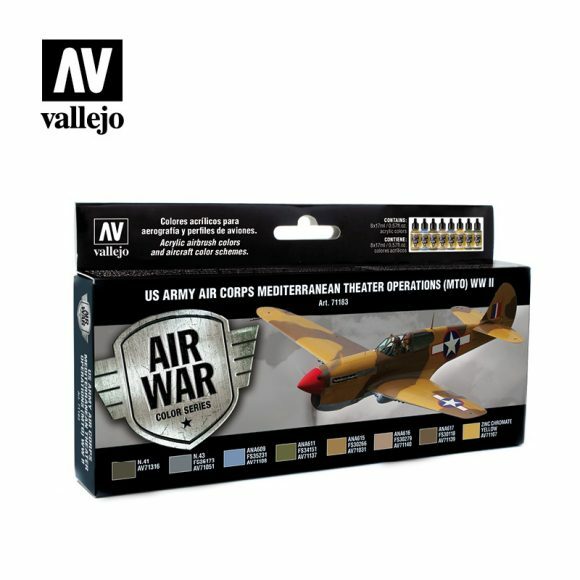 ANA 616 Desert Sand (FS 30279): Color developed for the USAAF for dry and desert theatres of operations.Color was applied to the upper surface only, or combined with ANA 613 Olive Drab, and lower surface N.43 Neutral Gray. 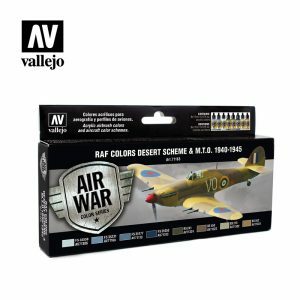 ANA 617 Dark Earth (FS 30118): Upper surface color desert pattern, combined with ANA 615 and ANA 609 for lower surfaces, similar to the RAF colors for this theatre of operations. Zinc Chromate Yellow: Basic primer used by the aeronautic industry to protect interior and exterior structures.